Includes Yordenis Ugas vs. Cesar Barrionuevo & Adam Kownacki vs. Charles Martin. Includes David Benavidez vs. Ronald Gavril II & Ray Robinson vs. Yordenis Ugas. Includes Jarrett Hurd vs. Jo Jo Dan & Javier Fortuna vs. Omar Douglas. Includes Sammy Vasquez vs. Aron Martinez & Dominic Breazeale vs. Amir Mansour. Includes Alfredo Angulo vs. Freddy Hernandez & Terrell Gausha vs. Steven Martinez. Includes Daniel Jacobs vs. Sergio Mora. Includes PBC: Corner to Corner preview show. Also: Andy Lee vs. Peter Quillin. Includes Lamont Peterson vs. Edgar Santana & Daniel Jacobs vs. Jarrod Fletcher. 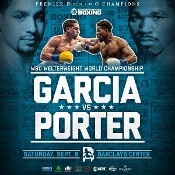 Includes Deontay Wilder vs. Malik Scott, Juan Manuel Lopez vs. Ponce De Leon II & Daniel Jacobs vs. Milton Nunez. Includes Paulie Malignaggi vs. Pablo Cesar Cano, Peter Quillin vs. Hassan N'Dam & Devon Alexander vs. Randall Bailey. Includes James Kirkland vs. Carlos Molina.